A god friend of mine does not like to eat breakfast, but she does like to drink coffee. She does find that eating breakfast helps her with her energy level during the day so she is always looking for ways to make her first meal palatable. As a coffee fan myself and frequent “grab-and-go” breakfast eater, I like the idea of mixing coffee with some other healthy things and slurping it up as I run out the door. Also, I usually have some cold leftover coffee sitting around. Coffee is also a wonderful flavoring agent – not unlike chocolate – in its intensity. I used chia seeds in this smoothie because I bought some for my Chocolate Chia Seed Pudding. They add a thickness to the smoothie which makes it more like a milkshake. The fact that chia seeds are high in calcium, iron, fiber, manganese, magnesium, selenium, and vitamin B6 is also pretty nice. These seeds are expensive but they keep for a long time and they are a great investment in your health. 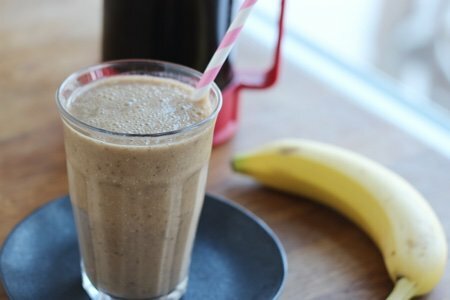 Have you tried putting coffee in your smoothie? Put coffee, almond milk, banana, and chia seeds in a blender and blend until smooth. Serve immediately. I love coffee and anything mocha so this sounds like a good healthy morning drink or even a afternoon or nighttime snack. I do this with a frozen banana and instant coffee. Such a treat in the morning! Can you taste the banana? I love bananas...by themselves, hate the flavor when mixed with other things. Especially cannot imagine banana flavored coffee. A tablespoon of protein powder would make it more of a meal. I use brown rice vegan protein powder which will add 12 g of protein. 12g of sugar is quite a bit, as are 24 carbs. Substituting 1/2 cup of berries would reduce both the sugar and the carbs for anyone watching their blood sugar. But I'll pass this a long to a friend that does drink coffee. I love this recipe and coffee. Because coffee and all caffeine depletes the body of magnesium, I take a magnesium supplement every day. My go-to morning smoothie is a recipe I read on this web site about 3 or 4 years ago: frozen banana, 1 - 1 1/2 cups coffee, 1 TBS unsweetened cocoa powder. It's great. I usually add a third to a half cup plain yogurt for protein and sometimes a shake or two of cinnamon. Turns out a tiny bit different each time depending on size of banana and the amount of coffee, but it is always filling and yummy. I find that frozen bananas are really sweet and that no additional sweetener is needed. THIS is what I have been waiting for... I have tried to do the 'fruit smoothie' in the morning, but I just can't give up the coffee - I've made the coffee and have everything ready to go for the morning! Was so looking forward to this. Made my own almond milk, and found the smoothie was disgusting. Sorry but I can't believe anyone would post something so awful. @Bernie - I am so sorry you didn't like it. > Hi Madeline and all, you could use flaxseed meal instead of chia seeds. I keep mine in the fridge. It can be found next to the flour at your grocer and it is very inexpensive. The bonus? Flax is high in Omega-3. It can also be found in oil form and also used as a substitute for eggs in a recipe. I did not know Chia seeds have such healthy properties . I love all kinds of smoothie . I 'll try your combination because I usually skip breakfast but I like coffee. When I make a coffee smoothie, I freeze the coffee first. Makes it good and cold. I use cold very strong coffee, sugarfree syrup (like toasted marshmellow) and almond milk that I freeze frozee into mini ice cubes..... yummmy. sometimes I add of dark cocoa to taste. I too, like the coffee (will try it frozen sometime) smoothie. May I suggest adding 1/2 c frozen, unsweetened raspberries or strawberries instead of the banana, plus the flaxseed & some cocoa powder to taste? Maybe even a little melted coconut oil at the end?! Or a bit of avocado for smoothness and good fat. You just have to experiment w/ingredients, and remember, not everyone will like what you like! Have you tried Skinny Mixes? They have many flavors, but their Espresso Chocolate - 3 ozs., 22 calories - is 'to die for!' The pommengranite flavor is wonderful in iced tea. I also have a Mama's (my Bariatric Dr. mother's recipe)Frappe that is a great drink for breakfast (has protein powder in it). You can buy it online or Home Goods & Tuesday Morning carry it. Online it is $6.99; in the stores (except Beale's-$9.99)it is $3.99. They also have drink mixes (i.e., Marguerita,etc.). Please note that strawberry/watermelon makes a delicious smoothie! Having had lap band surgery (but still love your website), smoothies make life so much easier! There is a drink I purchase as a treat in the weekends from a cafe called the breakfast buzz. It's a blended drink with espresso, protein powder , milk of choice , chocolate syrup , pb, and a banana. It is the most delicious drink , but it's too expensive and probably too decadent for an everyday drink. I made my own version with coffee, protein powder , banana , powdered pb, and unsweetened almond milk. I almost bought choc pb protein powder to add to this so I can skip the choc syrup and pb and replace it with the powder for some more protein. I ended up getting vanilla protein powder which works well in the drink too. Thanks for sharing this breakfast idea, and I hope my tip was helpful!